ABI's BoardMaster External Case is an affordable solution that saves customers time and money, increases asset availability and reliability. 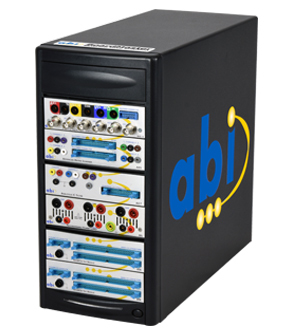 With the ability to be customised and include ABI's full range of instruments, the BoardMaster External case provides a cost-effective test solution used in prototype validation and troubleshooting, end of line testing and field repair applications. The system connects through USB to any standard Windows desktop or laptop running Windows 7 and above. The BoardMaster External Cases comes complete with ABI's multi-license and user friendly SYSTEM 8 Ultimate Software on a CD Rom. Customers are guaranteed to receive FREE software updates for life and will not be charged for additional seats or maintenance fees. The powerful yet easy to use software includes user access management, ABI's exclusive TestFlow Manager as well as a wealth of customisation options. Contact ABI's sales team for more information. This product is available as a complete and standalone solution which includes computer hardware. Please click here for more information. Note: The configuration above can be modified to suit special requirements and applications. Please click here for a review of each individual SYSTEM 8 module that can be combined into the external case. Some existing custom solutions can be viewed here.